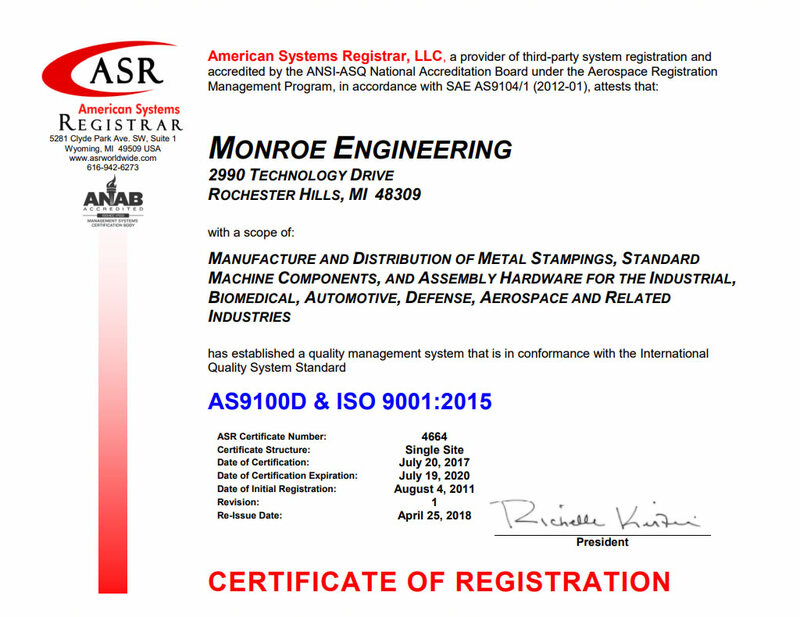 Monroe is AS9100D & ISO 9001:2015 certified and has a diverse customer base of manufacturers, distributors and catalog-houses across several vertical markets including aerospace/defense, automotive, medical, transportation and many more. Our Quality Policy is understood and implemented at all levels of our organization encompassing the quality of our product and the quality of our service. Procedures are in place to review all customer orders and contracts to assure our customers' requirements will be met. All documents pertaining to methods and procedures used by us are controlled and updated to ensure that only current revision documents are utilized. Purchasing procedures have been established to assure that we purchase only from approved vendors. Process control documents work instructions defining all methods to control quality of our product and service. Inspection and testing procedures establish methods to insure all incoming product is inspected to ensure conformance to prints prior to storage or being released. Statistical techniques are used to verify acceptability of products. 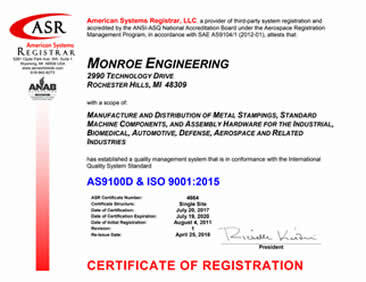 Monroe Hinge has established methods for the control and calibration of all inspection, measuring and test equipment. Procedures are established outlining the inspection of all products throughout all processes and records are maintained identifying the status of products from receiving through storage to delivery. Corrective and preventive action procedures outline measures to eliminate causes of actual or potential non-conformities. Procedures are outlined determining the corrective action required to eliminate the cause of a non-conformity. Procedures have been established defining methods used for product handling, storage, packaging, preservation and delivery of products. Training records are kept on all employees to assure complete and ongoing training. Internal Quality Audits are continuously performed to verify that quality activities and related results comply with planned procedures and to determine the effectiveness of Monroe Hinge Quality Systems. Are you looking for Quality?